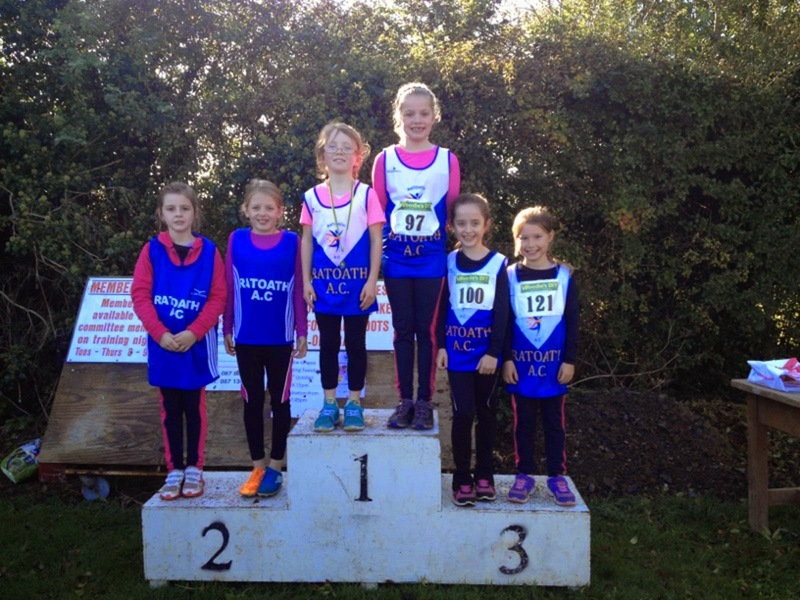 The Meath Un-Even ages cross country took place last Sunday at Fr. Murphy’s Athletic Club, we were blessed again with good weather and we had another great turnout from the club. The u 9 team were competing for their first time and they got off to a winning start bringing home the gold in the girl’s u9 team event with great performances form Ciara Coroner 1st, Cara O’ Sullivan 5th, Caoimhe Fitzsimons 6th, Jane Dolan 9th, Kate Raftery 10th and Caroline Byrne 23rd. We were unable to field an u9 boys’ team; Gerard Leavy being our only competitor putting in a great run finishing 7th. More gold was on the way with both our u11 boys and girls teams winning their respective team events, In the largest field of the day with 60 athletes competing Aimee Doherty, Sophie Quinn and Eabha Toole all made the podium finishing 1st, 2nd, and 3rd, Laura Kelly 11th, Molly Keane 12th, Amelia Campbell 13th, Matilda Ruhan 15th, Ciara Subiran Walsh in her first cross country had a great run in 25th, Niamh Murray 39th, Ellie Mahon 51st, Lily Nannery 45th, Aoife Casey 50th, Rachel Conway 52nd and Sophie Greene 55th. The boy’s team were in great form and in another large field Fionn Drummond finished strongly to take silver, Harry O’ Connor finished 4th with a powerful sprint on the run in, Eoin Kane put in another great performance finishing 5th, Kyle Witter who put in a confident run and was in the leading group of 3 for most of the race finished 6th with Kevin Sommerfield Walsh competing in his first championship finishing 17th. The u13 teams were down a few of their regular athletes but put in good performances none the less with both girls and boys teams finishing 3rd. Ella Healy had a another solid run finishing 4th for the girls followed by Lili O’ Connor 12th, Sophie O’ Connor 20th, Emma Coroner 28th and Kate Smith 35th. Oisin Kelly has really taken to cross country and was first home for the boy’s team in 8th, followed by Matthew Buckley 14th and Stephen Kiernan 21st. Our U15 girls team just finished outside the medals in 4th, Karen Hayes having a great run out of her age group in a highly competitive field finished 4th, Aoife Kelly also running up an age finished 18th with Sophie Dunne 21st. The u15 lads put in a great performance with strong runs from Ciaran Barry 7th, Harry Haskins 8th and Harry Bailey 11th earning them silver in the team event. Aine O’ Connor had another strong run and claimed her first Meath Cross Country title in the girl’s u17 race, Amber Roche had a good run also finishing 4th, unfortunately the girls were one athlete short of making up team and so we were unable to medal in the team event. The u17 boy’s race had a quality field with a number of National title and International title holder taking to the line, Philip Marron and Alex Hunter who are just getting back to form put in steady performances finishing 4th and 6th and with Brian Kiernan finishing in 12th place the lads won the team event. Hugh Kelly was our sole competitor in the intermediate men’s 8k event and he put in another good run finishing 18th in a very competitive field. This was another great year for the club at the Meath Cross Country Championships winning 6 individual titles in the girls u9,10,11,12 ,17 and boys u10 events, silver in the u10,11,16 girls and boys u10 & 11 events, bronze in the girls u11,12,13 and boys u16 and 18 events. We also won 7 team titles in the girls u9,10,11,12 and boys u11,14 & 17 events, silver in the boys u10,12,15,18 and girls u14 & 16 team events and bronze in the girls and boys u13 event. Thanks to all Parents and athletes who attended both days, and congratulations to all athletes who have qualified for the Leinster Championships.